Are You Taking Advantage of Webmaster Tools? Home Ecommerce Platform Are You Taking Advantage of Webmaster Tools? Search engines don’t just spend their energies trying to outsmart webmasters (or rather, SEO practitioners) — they also give back to the webmaster community. Webmaster tools offered by Google, Yahoo and MSN, help site managers identify various problems with their sites, along with other features. But that’s not all, you can also check out which of your site’s pages have links from other sites (the more relevant links you have from respectable websites, the better). This can help you recognize links from bloggers (maybe it’s positive or negative feedback), partners and other sites. It can also help you track your link building / marketing strategy — just don’t expect the tool to show you every single link Google knows about. You can also use the “page not found” report to locate URLs that other sites have linked to that don’t exist on your page (a typo or a page that doesn’t exist anymore). You can “save the link” by redirecting that link to the proper page, or contacting the webmaster of the other site to fix the link. There are cases when you need to block search engines from crawling certain pages or areas of your site. For example, your staging site and secure pages. Other times you might find a rogue URL that slips into the Google Index that you don’t want in there, like a URL with a session ID. The worst case is someone Google’s your website and that session ID appears instead of your home page, with the page title “ERROR” — I’ve seen it happen. Get slapped with a Google penalty? 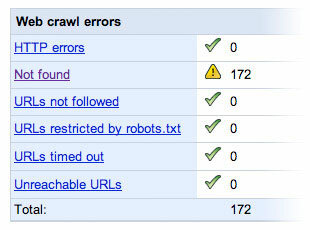 You can use Google Webmaster Tools to request re-inclusion (after you fix the reason why you were penalized). Google’s not alone in offering webmaster tools. Yahoo and MSN (Bing) offer their own too. You’ll need to sign up for them each separately (with Yahoo ID and Windows Live accounts, respectively).